I collect dragon tears. It isn’t difficult; they’re insidious and subtle, and they seep through my armor and into my skin like ink, leaving me stained, soiled, sorrowful — a human map of misery. The Dragon Atlas, I call it — marked with the precise locations of honor and shame. Dragons cry for the same reasons we do — pain, heartache, joy. We think of them as wise and cold, but wisdom is no antidote to empathy. Dragons are kings of empathy. That’s what makes killing them so hard. There was Vyurfang, short for something unpronounceable in dragon-tongue. I stood on his chest, his broken limbs splayed out across the rocks, the point of my longsword slipped between two diamond scales. I kept my back to him, and he turned his sky-dark eyes on my mirrored shield, and said “I am sorry, Solna,” even as he tried to use my name against me. He cried as I slipped the blade home once, and again, and again, and again, through every chamber of his heart. He cried as his long body writhed in agony, as I came down to hold his head against my bosom and snap his tired neck. The tears soaked through the metal plate and the cotton gambeson and steeped my chest in sagacity and shrewdness, experience and acumen. I wash and wash, but I cannot get it out. In the town, they hailed me as a savior, offered me fine wines, rich foods, soft beds. Handsome men, pretty women — I refused them all, and in the parlor of the inn they whispered to each other about dedication and purity as I shed my futile armor. “Send up hot water,” I told the landlord, “and keep it coming.” I’ve done this before, and though no water can cleanse me, it’s better to try than to despair. A dragon taught me that. When we were girls, I was the dragon. 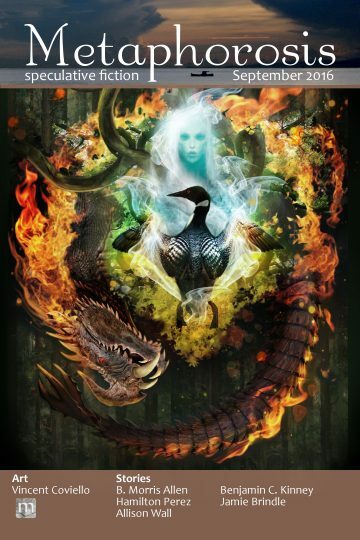 “Breathe fire, Solna,” Elyndra commanded, and I would roar and cough on all fours, and she would hack off my head. “Why must you play with that girl?” my mother asked, as if she could not see Elyndra’s in-born grace, her golden beauty. After Vyurfang there was Cold-Heart, whose only weakness was in her mouth, into which I fired an iron quarrel when she spoke of duty and of passion. Her tears are etched into my forearms where I tore the quarrel out so that she would not lie with her mouth open and speechless as her body turned to stone. And after Cold-Heart, there were Klarsharp, and Windclaw, and Sharpstone, and Zmeyra, and more others than I care to count. Each one marked me with their tears, wrote their passing on my skin. I feel the burden of it like a cloak of chain, slowing my steps, clouding my thoughts. Even when I sleep, it drags me down into nightmare, and when I wake, I force myself to stand only so that I can be doing, not thinking, even if that doing is only a slow march to one more death. Dragons are a violent breed, with an instinct for survival so deep that even after death, they strive for life. Even while they hope to die, they try to fight. It is an instinct in them, I think, that they cannot suppress. I kill them this way and that way, and every time I think them dead, they twitch and claw and tear. And weep. “I have you to protect me,” she smiled, and kissed me on the cheek. “And Osal is clever, and his father is the glass-smith.” But she wouldn’t look me in the eye, and her kisses grew fewer as our bodies grew curves. My armor, once of mirror-shined plate and tight-knit mail is rent now to tatters, discarded across fields and hillsides, caves and plains. Only my weapons remain: a sharp sword, a strong bow, and a promise, burdens now so heavy I can barely walk. Today, it will end. Today, I will kill my last dragon, or she will kill me. There is always that hope. Today, I go without even my mirror shield to save me from enthralling dragon eyes. I will kill her with my eyes closed, or she will enslave me, or I will die. Today is the end. They watch me as I go from the village. I have saved a pretty dress for today, a soft cotton gown they gave to me in Hatherton. The canvas baldric pulls against it, pricks the fine weave with coarse fiber until I give up and carry the sword in one hand, arbalest in the other, and the promise on my conscience. I hear the children snicker at a savior in a sun dress, hear parents chide them in quiet, tolerant voices. I have kept my boots, for the way is muddy, and there are streams I must cross. At the first, I slip the sword under one arm, and pull the dress up to my thighs. It is easier than plate, and more comfortable. The children laugh and point, and make jokes about dragons’ legs, but they come no further. We are too close now for childish dares. It was daring that brought me to this day, and desperation. Desperation to catch the eye of Elyndra, a spare, fine willow to my tall and sturdy walnut. Daring to think she might value strength and commitment over craft or intellect. When we were women grown, Elyndra went in to the castle, as a lady’s under-maid, and I followed her. No lace and fripperies for me, no delicate embroideries on satin underthings, but canvas straps and heavy pikes. “I’m sorry,” Elyndra said when we met in the evenings. “But we must use what we have. I’m pretty. You’re strong. Best not to argue with fate.” Fate decreed that her mistress invite Olas to show the Countess and court his tricks of glass and wire, and that I enlist as guard trainee. “I will send my wages,” I mumbled. The dragon came not long after, a long dark shape like a storm cloud spread thin by wind. It settled on the mountain behind the castle, on the steep slopes that fell off in cliffs to the river below. I found a sword easily enough, a rusty piece of steel from the practice racks. Armor I did without, going forth as near-naked then as I do now, though more sensibly dressed in cotton trousers and tunic. I crossed the shallow valley below the castle, went quiet into the dark of the mountains, and climbed through the mist, glad it muffled my scrabbling steps from the dragon whose shadow filled the tap-rooms. I found him just above the treeline, in a cave less tunnel than scrape, a shallow overhang of rock exposed to cold winds that fell down from the ice above to the cliff below. I had no mirror, for I was brave, not shrewd, and when he opened his eyes to me, I was lost. I spent untold centuries in delirious contentment, washed in cerulean tides that hinted love and warmth and certainty until he closed his eyes again and I was free. I wept for loss and fell to my knees to beg him to take me back, my sword discarded dull and evil at my side. I told him then, in stumbling, stuttered words of my plan, my hopes, my dreams. Reflected in dragon eyes, Elyndra seemed distant, a slender and a frail reed on which to rest my faith, and I saw clearly now how mad my thoughts had been, how palpable her disinterest in me, how evident her hopes of wealth and position. “I’m the least there is,” I replied as my future fell around me, and I saw in his eyes that even my self-pity was an appeal for deliverance. “Yet you are the tool I have,” he said, “and we must both make do.” He snaked his head down from his cave to hang beside me in the chill air. “I cannot give you love,” he said. “Though I see you need it, that is the one magic dragons do not have.” A lucent tear escaped one lapis eye, and, unthinking, I stretched a hand to touch it. Under my finger, the tear smeared against hard scale, and I felt it enter me, sliding past barriers of skin and flesh to touch my spirit. “A dragon’s tears are potent,” he said. “Fools hope to sell them. The wisest know them for a burden, and a shackle.” I touched my tear-stained finger to my chest, felt it write destiny on my heart. “I have no love to give you,” he repeated, though I could see in his eyes a love of land and peoples and of me. “I have pain and duty and despondency, and if you want them, they are yours.” In that moment, I forsook Elyndra and happiness and hope, and gave myself to fate. I thought of the Osal, with his contraptions of wire and melted sand that made my head hurt, and the carter rowing his silly land-boat down dusty roads. I opened my mouth to protest their futility, but the dragon shook his head. “Our turn for what?” I blurted, mind still full of flight and fantasy. “But why? Stay with us. Guide us.” I touched my tear-marked finger to his cold face above the fangs. “We cannot. Most of us are already gone. Only a few are left — those unaware, or unlucky, and myself, and my queen.” He turned his long body and stretched out wings the color of rain-flecked slate that spread out and above me to block the sun. With a snap, he flung them out and down. They crashed against the rock, sending dust and gravel into the icy wind. I wept to see him as he saw himself, a master of sky and land reduced to a creeping lizard, wings no more than a hindrance. I wept again as a dragon’s true sight showed this to be not self-pity but truth, not despair but acceptance. I looked about me. Fine dust had settled on the dragon’s useless wings, torn and crumpled at the tips where they had struck the rock, and leaking drops of emerald blood onto soil from which sprang moss and fern. Beside me, my discarded sword mocked my brash ignorance. I pulled my courage about me as best I could. “Let me help,” I said, as if a foolish girl with a rusty sword were of some value. Wisdom is not kindness, and truth is not comfort. I saw, through his eyes and my own, how unequal I was to the offer I made, how much he would have preferred a more accomplished servant, how little choice he had. I saw his dismay at my inadequacy, his determination to exceed it. We agreed then, how I would search out his fellows, and kill them despite themselves. He gave me a small sack of gems from the small hoard he had carried, taught me how to use a mirror, how to find a dragon’s weak points, how best to use them, and how to be sure of death. When we had done, and I had memorized and practiced and repeated to his satisfaction, night was well upon us. Had any human ever slept with a dragon? I wondered, as I snuggled close against the fine scales with their scent of oats and pepper. In the morning, I watched as he he flung himself from the cliff, and fell, and soared for one last moment, like leaves of autumn gold defiant in the sun. And then I climbed down to his broken, bloody body to wipe away his last tears and cut off his head. I took them with into town — the tears invisibly traced across my palms, the head across broad shoulders, with flowers springing up in my path where emerald blood had trickled down my back and legs into the soil. I felt my body stronger and harder than I had ever known it, and my heart more desolate. I delivered the head to the Countess, and she gave me honor, gold, and armor. All went as the dragon had predicted. ‘The dragon,’ I called him, for only now did I realize that I had never learned his name, and because the humans did not care. They looked at me, with my dragon-marked skin, and looked away. I set off to the next town afoot, spurning the carter and his land-boat. Only as I left did I think to look for Elyndra. I found her, in her cotton dress that shone like satin, saw her wide-eyed fear as she stood next to Osal for protection against the horror and hero I had become. I am still the horror. I kill noble, beautiful creatures when they are weak and defenseless. The map of tears across my body has grown so heavy now that only my sword keeps me upright. I dull its sharp point, stabbing it into the stone of the mountain as I climb. At the last narrow scramble, the arbalest grew too heavy, and I left it beside the path for some foolish child to find. It is hard to care about the humans now that I have seen so many in so much foolishness. They celebrate the death of dragons as if it were an accomplishment. If that is their future, they deserve it. I can sense the last one near me now, smell her pepper scent around a ridge of jagged rock This the queen, of course. The last dragon. The last of my burdens, of my impossible task. I put down my sword to tug my gown straight, brush the burrs from its hem. It is tight at the waist and shoulders, and it leaves my arms naked to the wind, but it is the best I have, the only good thing I have. I leave my sword where it lies. In a queen, the instinct for survival may be stronger. She may kill me on sight — sear me and my pretty dress with a breath of fire, or rend me with her fangs. I can hope. I step out around the ridge. She is vast, this queen, the size of houses. Her scales are violet and indigo and blue and black in the autumn sun, and her wings form caverns across the slanted meadow. Her eyes are the green of forests and rain. I lean my spirit toward them … and do not fall. “You are proof against us now, child,” she says, but I have enough dragon in me now to know it for a joke, to know that she holds back her power. “I cannot kill you,” I say, letting my shoulders slump. Let there be an end to death at last. My arms are cold, and the dress does little to warm the rest of me. “There is no need,” she replies, and rests her head beside me on the ground. “I cannot kill you,” I insist. “I will not kill you. I have done enough.” I look up to her forest eyes, and beg them for release. “Let me rest. Let me finish.” We both know what I mean. “We have used you hard,” she admits. “We have been unfair, even cruel.” I see the truth of it in her gaze. I think back on all the bodies, the blood. I feel the tracery of tears burn across my hands, my chest, my back. Not bravely, freely chosen. Not voluntary service to a dying race, but an unwitting tool — a fool of death. I sit, and wait for my own tears to flow, to fill the hollow of my disillusion. “To enslave,” I spit, though I cannot muster anger. “I will not kill you,” I say again, bitter now with the knowledge that I have been used, that I am as poor a vessel as I once feared — that I was chosen for my very weakness. Relief grows in me as well; I am done forever with that task, done with blood, done with dragons and their deaths. “No other could have done it. Strong, determined, implacable. Enthralled.” She shows me the truth of it, shows me her gratitude. Perhaps I have done well. Perhaps not. Perhaps I am only tired. Whatever the truth, I want no more of it. “I will not kill you,” I say a fourth time. “Death and blood,” I say, for that is what I have given. What I was forced to give. I am dull now, with disillusion. I want no more revelations, no boons. I want … I do not know, and I sit in silence, my pretty, foolish dress a dusty folly, poor shield against the mountain cold. I want no more killing, no more effort, no more decisions, no more plans. No more weapons. No more tears. Above all, no more tears. “Take me with you.” On that final flight, the last voyage of the last dragon. She looks at me, forest eyes impenetrable as oak. “Very well,” she agrees, and her eyes glint with moisture. She gathers me into one huge paw, and I see the razor claws pressing into her scales as she stretches them to keep me safe. It hurts her, but I do not care. Why should I be the only one to hurt? And if she slips, and the claws close in, what matter? The dragon tears on my skin reproach me, show me the child that I am acting. I tell them silently to let me die as a I choose, and they do not argue with my wisdom, little as it is. We rise with a clap of thunder and a rush of wind, and then we are high above the land, and in the village below, the humans run like raindrops, away, away, away. We fly over the land I have known all my life, over the sites of my bloody executioner’s work, and of my birth and childhood. It is small, inconsequential, the sites of my great and awful deeds a tiny patch of green and brown upon the great sprawl of land and sea beneath us. There is too much of it! The mountain I climbed this morning, no more than a foothill for a range of granite peaks, with beyond them the glint of water. We follow rivers to the west, and I silently urge the queen on, further, faster, to see more before the end. “This is what we give you,” she says, and I feel her wingbeats falter. “These were our lands, that now are yours.” We slip in the air as the magic fades and I sense her muscles straining. We sink lower and lower, and my heart aches for all the lands I have not seen, the magic of horizon and discovery. Soon, the flight must end, and the queen and I will reach the end of our voyage, and the beginning of peace. We are hilltop-high now, above a green land of forests and rain and ocean. “This was my favorite,” she says, and there is regret in the soughing of her voice. “Here I was my happiest.” She swoops low over the waves on a warm, sandy beach, and I feel her tears bathing my body as her claws shift and the end nears. I close my eyes, and feel her joy and sorrow as she remembers happiness and her race dies. “I hope there is room for me in your Atlas,” she says. Then the claws open, and I am falling, falling, into the waves. I strike hard, and the breath whooshes out of me and the cold green is all around me, and I am sorry. I kick out for the surface, and the air, and as my head breaks through, I see a dark arrowhead against the sky, climbing, climbing out to sea. And then it falls. It’s better to try than to despair. A dragon taught me that. I hold the lesson close as a current carries me to an uncharted shore of hope and life, and the salt water washes me clean.